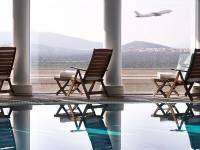 Our Cycladic Escape package offers only the best of this Mediterranean archipelago. Explore golden sandy beaches, whitewashed ciff-top houses, crystal clean blue waters and luscious green hillsides with row upon row of olive groves. Arrive in Athens and explore the ancient sights on foot with a walking tour that includes a guide, all the way up to the Acropolis. Then jet out of the city to the purely decadent island paradise of Mykonos with its cosmopolitan nightlife and superb beaches. From there, cross the waters to Paros and explore the old world port village with its many churches and monasteries. Just a short ferry ride away is the picturesque island of Naxos and its unfinished temple of Apollo. 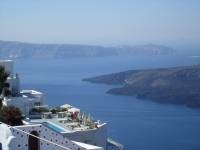 Finish the tour in the romantic and awe-inspiring Santorini with its black beaches and stunning cliff top sunsets. These islands will leave you breathless and feeling fulfilled. This 16 day program focuses on four of Greece's most famous post-card picturesque islands. To make your trip complete make sure you try and take in: a half day trip to Delos, a dinner out in Mykonos town, a visit to the old port town of Parikia for its nightlife on Paros, a visit to the unfinished temple of Apollo on Naxos and definitely enjoy a stroll along the cliff top pedestrian path from Fira to Imerovigli on Santorini. Description: Upon arrival at Athens International Airport you will be greeted by your OTI representative after clearing customs and provided with a welcome package and given a quick overview of your trip. In addition, you will be provided with additional tour options that you can purchase while in Greece. A private transfer to your hotel follows where you will spend the remainder of the day at your leisure. Overnight in Athens. 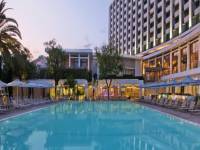 Description: This sightseeing tour will afford you the luxury of experiencing the two most important attractions of Athens. The Acropolis of Athens is one of the most famous archaeological sites in all of Greece. The new Acropolis Museum is the home to the masterpieces of the Acropolis, where they are displayed in stunning surroundings bathed in natural light. The tour begins inside the Syntagma metro station where you will visit the metro Museum with very interesting archaeological artifacts from the daily life of Ancient Athens that came to light during the construction of the metro. You will then continue on to the House of the Greek Parliament, the Monument to the Unknown Soldier and watch the changing of the guards. Your tour continues towards the National Gardens and on to the beautiful neoclassical Zappeion Hall, in front of which tower the surviving columns of the Temple of Zeus and Hadrian’s Arch, both of which you will have the opportunity to visit. From there you enter the famous Plaka district where you see the statue of Melina Merkouri. You will enter the Acropolis from the south slope so as to avoid the crowds and also to visit the Dionysus sanctuary and Dionysus Theatre built in the 5th century BC. Your guide will take care of the tickets so you can skip the line. As you begin to ascend the sacred hill a breathtaking view of the city below will unfold. Your guide will give you a detailed explanation of the glorious monuments of the Acropolis such as the Parthenon, the Erectheion, the Propylaia, the Nike Temple and the surrounding monuments such as the Odeon of Herodes Atticus, the Ancient Agora, the Observatory as well as the Philopappos, Mars, and Pnyx Hills. After your tour of the Acropolis site, you will have approximately 45-minutes to descend towards the New Acropolis Museum. You will have ample time to take personal photographs from many vantage points on and around the Acropolis prior to reaching the Acropolis Museum. Its unique design has incorporated the excavations which are visible under stunning glass floors. The Acropolis masterpieces are marked out and given the prominence they deserve through ideal interior atmospheric conditions, natural lighting. Additionally, there is easy visitor access, panoramic views and excellent layout of the exhibition areas. The museum exhibits about 4,000 artifacts. The tour ends at the Acropolis Museum. Description: After breakfast you will be transferred to the port of Piraeus from where you will board your select ferry for your sailing to Mykonos. Upon arrival in Mykonos you will be transferred to your select hotel. Overnight in Mykonos. 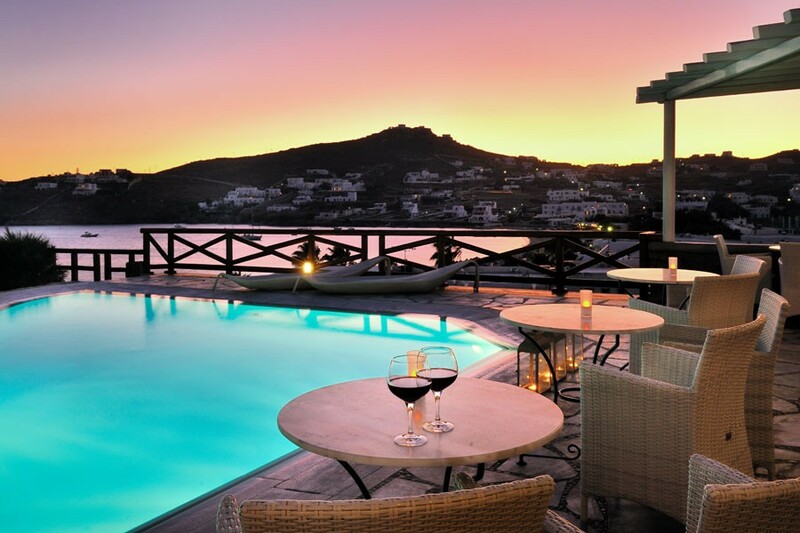 Description: Spend the next 2 nights in Mykonos enjoying the most cosmopolitan island in the Aegean. A morning excursion to the ancient island of Delos is highly recommended. 2 overnights in Mykonos. Description: Transfer from your hotel to the port of Mykonos from where you will board your ferry for Paros. Upon arrival at the port of Parikia on Paros you will be transferred to your select hotel. Overnight in Paros. Description: Spend the next 2 nights in Paros. Make sure to spend time on the beach and visit the beautiful seaside village of Naoussa. 2 overnights in Paros. Description: Transfer from your hotel to the port of Parikia from where you will board your ferry for Naxos. 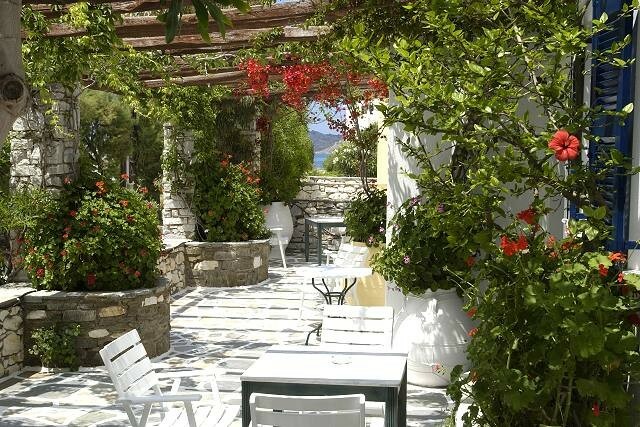 Upon arrival in Naxos you will be transferred to your selected hotel. Overnight in Naxos. 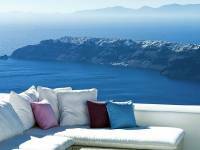 Description: Spend the next 2 nights enjoying this beautiful Cycladic Island. Some of the Aegean's finest beaches are found on Naxos. A night out in Chora (Naxos town) is highly recommended. 2 overnights in Naxos. Description: Transfer from your hotel to the port of Naxos from where you will board your ferry for the island of Santorini. Upon arrival at the port of Santorini you will be greeted and transferred to your selected hotel. Overnight in Santorini. Description: Spend the next 2 nights experiencing the most romantic island in Greece. Visits to the ancient site of Akrotiri and the artist's village of Oia at sunset are highly recommended. 2 overnights in Santorini. Description: Afternoon departure from Santorini for your return flight to Athens. Overnight at the Sofitel Athens airport hotel. 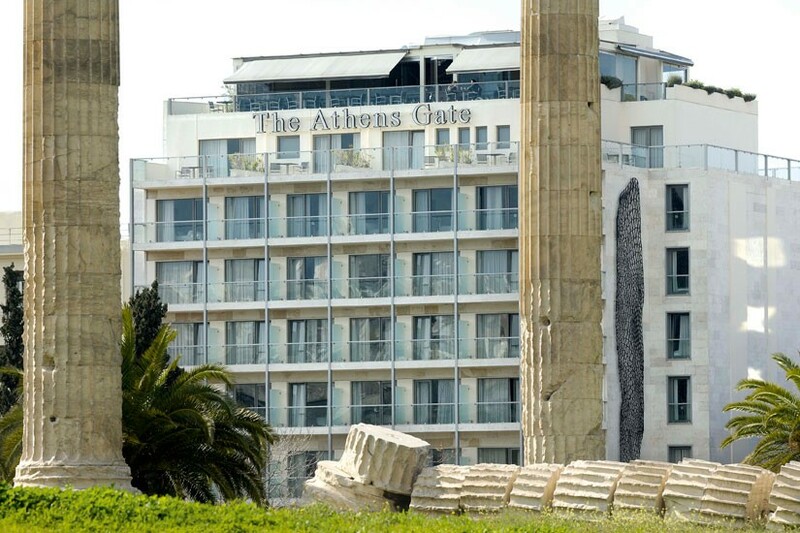 This is the new urban hotel in the center of Athens, embracing the city's heritage and contemporary culture. Enjoy a 100% authentic Athens experience, where one gives an A to the best of this enchanting city. Deliades Hotel is situated at the edge of Ornos Bay on a small hill overlooking the bay with a breathtaking view of Ornos Beach. The hotel features Cycladic architecture and is known as one of the most impressive hotels in Mykonos. Situated in a quiet part of Parikia on the island of Paros, Eri Hotel is a 10-minute walk away from the town centre and Paros Port, and is 300 metres from the beach. 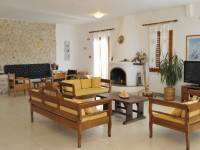 It offers a large swimming pool, 2 bars and rooms with free Wi-Fi. 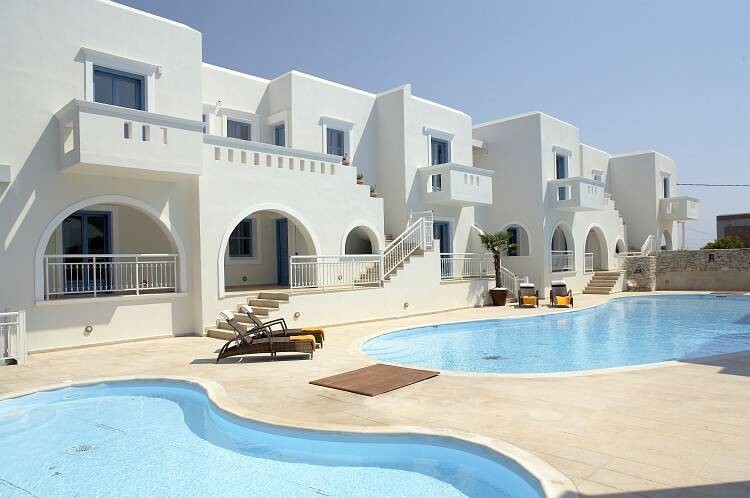 Manos Hotel is a 3 star hotel located in Naoussa on the picturesque island of Paros. It is a traditional cycladic-style accommodation just a five minute walk from the beach and the picturesque harbour with its cubed white washed houses. 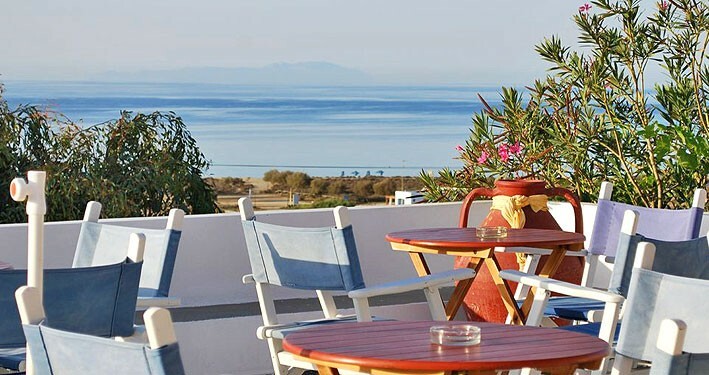 The Lianos Village Hotel offers an ideal accommodation in Naxos for those who want to really enjoy the setting and the scenery while also remaining just a short distance from the major tourist areas. The hotel is only five kilometers from Naxos town and steps from the gorgeous Agios Prokopios Beach as well. Dana Villas Hotel in Firostefani, Santorini offers elegant accommodation with traditional Cycladic architecture and stunning sea views. 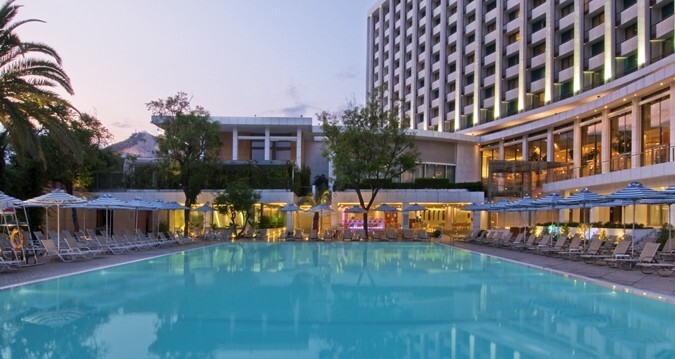 The Athens Gate is a modern hotel located in the historic district of Athens opposite the Temple of Olympian Zeus and within 500 meters of the Acropolis. 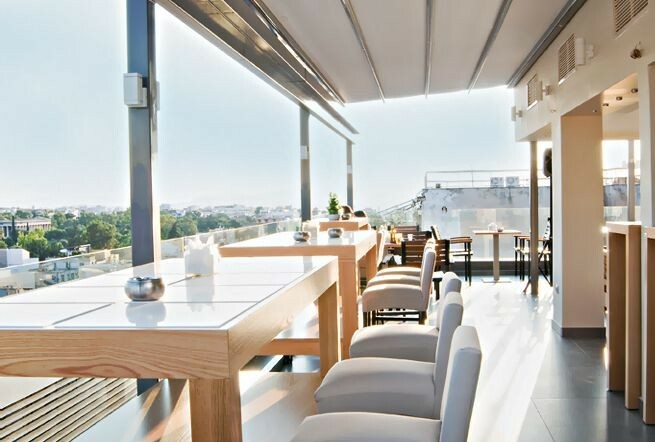 Take in Acropolis views from the Hilton Athens Hotel, a contemporary oasis in the ancient, bustling city of Athens. 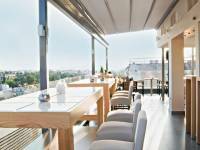 This central Athens hotel is located in the heart of the city’s commercial district, with the prestigious shops and cafés of Kolonaki surrounding it. The Sofitel Athens Airport Hotel is a 5-star luxury hotel situated 50 m from the arrival and departure terminals of Athens International Airport. 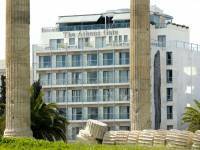 The Attiki Odos highway provides direct access to the hotel and is 28 km or 15 min from the centre of Athens. 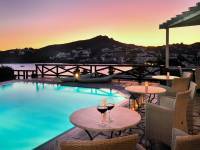 The 4-star Saint Andrea Resort is built on the north side of the island of Paros, just 1.5 km from the cosmopolitan town of Naoussa, with views of Kolymbithres Beach and Naoussa Bay. 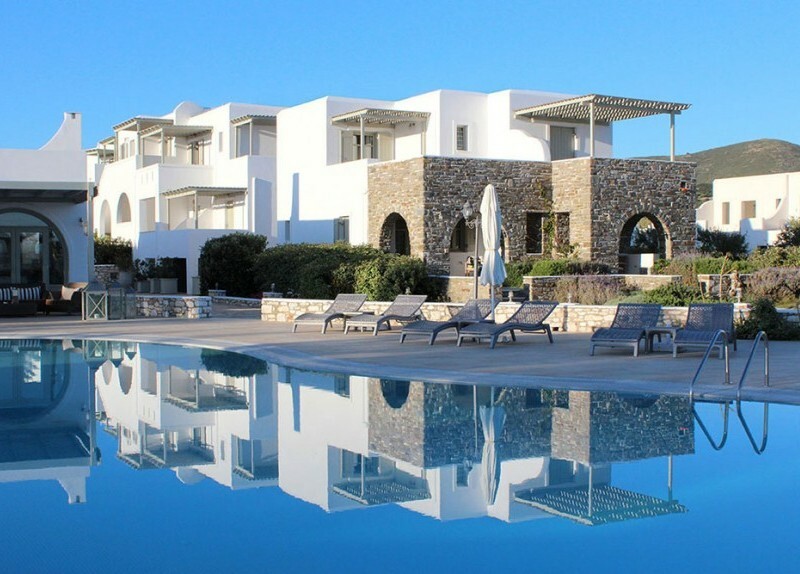 Lagos Mare is a 4 star hotel on the island of Naxos situated in Agios Prokopios, ideally close to one of Europe’s most wonderful beaches with soft sand and crystal clear water. Built on the highest point of the caldera, in Imerovigli village, the White Hotel offers its guests exceptional service in an idyllic environment complimented by breathtaking views. To get a quote on one of our fully customizable Independent Holidays click on the 'Get Quote' button and fill out the simple form. We will respond to your request within 24 hours. Alternately you can request a quotation by speaking to one of our agents in real time using our live chat feature or by calling our offices. All of our Independent Holidays can be tailored to meet your specific needs, call us today and to see how you can put the MedVisits advantage to work for you!